In a medium saucepan over medium heat, add butter. Once melted, add brown sugar, cinnamon, extract and salt. Cook, whisking often, for 10 minutes or until sugar starts to dissolve. Add cream and cook, whisking often, for 5 minutes or until mixture coats the back of a spoon. Remove from heat and stir in bananas; let cool. 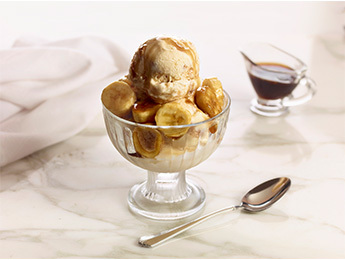 Serve warm over your favorite ice cream.